Save £50 on the Amazon Echo this Bank Holiday weekend | What Hi-Fi? Never one to miss an opportunity, Amazon is preparing itself for another weekend of deals with savings on the Amazon Echo and Echo Dot. The Bank Holiday weekend is just around the corner, so Amazon is of course set to offer a fresh batch of discounts across its monstrous range of products. Amazon's own devices are leading the way, with the Echo down from £149.99 to £99.99 and the Echo Dot down from £49.99 to £44.99. We gave the Amazon Echo a solid four-star review, thanks to the impressive Alexa voice assistant and the decent selection of features. Only the so-so sound quality gave us cause to grumble. 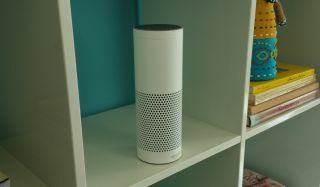 A £50 saving certainly makes it much more tempting - even if a new Echo is rumoured to be in the pipeline. Expect to see plenty more deals go live across the weekend and we'll be rounding up the best - from Amazon and other retailers - on our Bank Holiday deals page.